3003 aluminum alloy is an aluminium-manganese alloy which approximately 20% stronger than alloy 1100. This alloy is readily formed by either conventional cold working or hot working. Haomei offers 3003 aluminum coil, sheet, plate and tread plate covered by the ISO standard 6361 and the ASTM standards B209, B210, B211, B221, B483, B491, and B547. The 3003-H14 is a softer, more formable aluminum sheet and 3003 tread plate offers increased rigidity in the material as well as hiding fingerprints and dents. Commonly used tempers include H14, H16 and H18 while others are also available by customers’ demands. AL 3003 is an alloy with very good corrosion resistance and moderate strength. Excellent weldability, formability, with good machinability makes 3003 Aluminum coil, sheet and tread plate is popular and economical choice in Appliance Components. Alloy 3003 can be cold worked to produce tempers with a higher strength but a lower ductility while not heat-treated or used in casting. 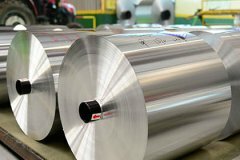 It is commonly rolled and extruded as aluminum sheet and foils which in different applications such as truck and trailer roofing, cooking utensils, pressure vessels, refrigerator panels, gasoline tanks, heat exchanger, furniture components.